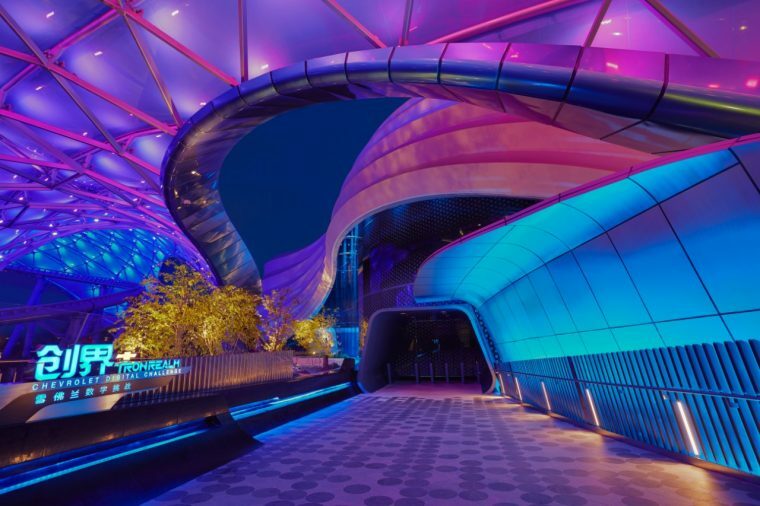 When the Shanghai Disneyland Park opened in June of last year, one of the most highly-discussed and popular attractions at the theme park was the Tron Lightcycle Power Run. This bike-based launch coaster was different from any other ride that Disney had implemented into any of its parks. The novelty of the ride unsurprisingly made many domestic Disney park fans more than a little green with envy. However, given recent revelations from the Walt Disney Company, those fans need not be jealous any longer. The company revealed that the Tron Lightcycle Power Run will be coming to Disney’s Magic Kingdom park in Florida. Rumors of Disney bringing the Tron roller coaster stateside have been circulating ever since the Shanghai park’s opening. Those rumors also stated that, to make room for the ride, Disney would be getting rid of another automotive attraction: the Tomorrowland Speedway. However, it would seem that the Speedway will be staying in place, at least for the time being. Instead, Disney reports that the Tron Lightcycle Power Run will be built in an area behind Tomorrowland’s other coaster, Space Mountain. Are you ready to enter the Grid? Based on the 1982 film Tron and its sequel Tron Legacy, the Tron Lightcycle Power Run places riders on their very own light cycle. From there, the guests are sent into the “Grid,” where they must face off against other light cycle riders, reaching speeds of up to 60 mph. It’s currently unknown how different the Magic Kingdom version of the ride will be compared to its Shanghai counterpart. In Shanghai, Chevrolet serves as a sponsor of the ride, but since Chevy sponsors the Test Track attraction at Epcot, the sponsorship might not be carried over. Another uncertainty regarding the ride has to do with its opening date. No official timetable has been set, though Bob Chapek, Chairman of Walt Disney Parks & Resorts, assured audience members at Disney’s D23 Expo that the ride would be operational by Disney World’s 50th anniversary in 2021. If you’re a fan of Tron, or just roller coasters in general, then you definitely have a new Disney attraction to look forward to in the next few years.